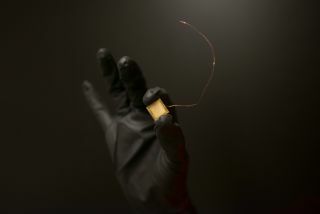 An image of one of Accion's small electric-propulsion systems. Natalya Bailey was always interested in space, but it wasn't until she was sitting in a university class on propulsion that she realized what she wanted to do with her life. She was struck by how little engineers know about electric propulsion systems compared to the traditional chemical fuel-powered equivalents. In 2014, she co-founded her own company, and if all goes well, the first rocket carrying her technology will launch later this weekend. That satellite is due to launch from New Zealand overnight on Nov. 11 EST (early Nov. 12 GMT) on board Rocket Lab's Electron rocket. Once deployed, the satellite will photograph Venus and other targets. We talked with Bailey about anticipating her first launch and the appeal of electric propulsion. This interview has been edited for length and clarity. Space.com: It seems one of the real benefits of ion propulsion is that it gives you a lot more flexibility as to where you go. Natalya Bailey: You kind of hit a wall with chemical propulsion, because it still is so expensive and consuming of your mass and volume to launch a chemical propellant. Whereas, with electric, you get much more bang for your buck, although it does take longer to accelerate using electric propulsion, so you have to have the time. That's kind of the caveat. Space.com: NASA's Dawn mission to the asteroid belt, which ended Nov. 1, was driven by ion propulsion. Did that mission influence you in any way? Bailey: Reading the papers and looking at the qualification testing and talking to the people involved in that process actually helped me figure out how to lead that at Accion because of the engine that they flew. The end is one thing, but the beginning I used as a jumping-off point for Accion. Space.com: Why did you want to go into the commercial side of space? Bailey: Because there was the infusion of private venture capital, it made it possible to do the types of things I wanted to work on in a private setting. If I had graduated 20 years ago, I would have definitely gone to work at NASA or a research lab, because there wasn't that option [of the private sector]. I think it's a really cool way to marry something that is very [research and development]-intensive and inspirational, vision-driven and that has a real commercial application, so I feel like it's fortunate timing for me. Space.com: What size missions are you looking at right now? Bailey: Commercially, Accion's bet is on the 100-400-kilogram [220-880 lbs.] spacecraft size. That's kind of broad, but I'm trying to capture most of the communications buses and constellations, and they fall in that. That's what I think is most commercially interesting in the next 10, 15 years. Cubesats have been for us and for the world a fantastic way to demo technologies or to build up space capabilities within new organizations or countries, but commercially, it's a hard sell to go after a lot of cubesat missions. Space.com: What would it be like to be a human on board an ion-propulsion vehicle rather than a traditional vehicle? Bailey: Most probes we've launched without any sort of propulsion whatsoever, and they've relied on things like gravity assists or maybe an initial insertion using a bigger rocket. Most of the rest of the mission has been no propulsion at all. So, electric propulsion like an ion engine could speed that up significantly, but it's still fairly gentle. You probably wouldn't actually notice a big difference, but you would just get there in a 10th the time as you would have previously. Space.com: Is there any kind of robotic mission you'd particularly like Accion's technology to be a part of? Bailey: Something like taking off from landing on a smaller planetary body with less gravity. If we send a robot down and perform some kind of exploration mission using an ion engine. Where it's possible because the gravity isn't as high as it is on Earth, to lift off from the surface of that I think that would be really exciting. Space.com: Accion's first launch is scheduled for later this month. What's that like for you? Bailey: I think it's probably the coolest thing I've ever been a part of. [The launch is] from New Zealand. I keep checking flight prices. I don't think I'm going to go, because it's just so long, but it's the coolest thing Accion will have done to date. Hopefully, it becomes not the coolest thing eventually, but it's very exciting. Space.com: The launch has been delayed by about six months — is that at all concerning you? Bailey: When you're designing systems and testing them and looking at the environment in particular during storage and prelaunch, you design to averages. You don't design to possibly be sitting on a launchpad for six months. … We're a little bit nervous because of that, but overall, very excited and hopeful.